Abstract: In this paper, a Block Iterative Method with Adaptive Thresholding for Sparse Recovery (BIMATSR) is proposed to recover the received signal in an under-sampled distributed multiple-input multiple-output radar. The BIMATSR scheme induces block sparsity with the aid of a signal-dependent thresholding operator which increases the accuracy of the target parameter estimation task. We have proved that under some sufficient conditions, the suggested scheme converges to a stable solution. Moreover, different simulation scenarios confirm that the BIMATSR algorithm outperforms its counterparts in terms of the target parameter estimation. This superiority is achieved at the expense of slightly more computational complexity. It is also shown that in this application, random sampling scheme offers better performance than random Gaussian matrix, while it has simpler structure. Abstract: This paper deals with the problem of censoring outliers in a class of complex multivariate elliptically contoured distributed radar data, which is a vital issue in radar signal processing applications, such as adaptive radar detection and space-time adaptive processing. The maximum likelihood (ML) estimate of the outlier subset is derived resorting to the generalized likelihood function (GLF) criterion. Since the ML estimate involves the solution of a combinatorial problem, a reduced complexity but approximate ML (AML) procedure is also considered. At the analysis stage, the performance of the AML method is evaluated in the presence of both simulated and real radar data, also in comparison with the conventional generalized inner product (GIP) and the reiterative censored GIP (RCGIP) algorithms. The results highlight that the AML technique achieves a satisfactory performance level and can outperform both GIP and RCGIP in some situations. Abstract: A novel method of exoatmospheric guidance law design is proposed in this paper. By analyzing the nonlinear kinematic equations, a class of nominal motions that requires no maneuver effort can be derived for a nose jet control missile. A unique time to go can be solved online from the equations derived from the property of the nominal motion to guarantee a perfect interception. With the time to go determined, the nominal heading angle and heading angular rate can be obtained to impose an impact angle constraint. A backstepping-based continuous three-order finite-time guidance law is designed such that the heading angle tracking is guaranteed. The superiority of the guidance law is demonstrated by a series of simulation results. Abstract: This paper considers the fixed-time translational operation control issue for the spacecraft rendezvous task with a free-tumbling target. The translation dynamics model of the rendezvous mission under actuator misalignments is first established in the line-of-sight coordinate frame. Then, a novel time-varying sliding mode surface is constructed and a control scheme with the sliding manifold is proposed to achieve the fixed-time convergence of relative parameters’ tracking errors. It is interesting that the preceding convergence time can be altered explicitly according to the specific rendezvous requirements. Meanwhile, a modified updating strategy is developed to ensure system's fixed-time convergence property in the presence of lumped uncertainties (external disturbance and actuator misalignments). The associated stability proof is constructive and accomplished by the development of a Lyapunov function candidate. Finally, numerical simulations on rendezvous missions are performed to demonstrate the effectiveness and the superiorities of the designed fixed-time control scheme. Abstract: The ability of multiple-input multiple-output (MIMO) radar to provide enhanced performance has been verified in both theoretical and practical level. Through applying orthogonal waveforms, this type of system can realize far more observation channels than the actual number of transmit and receive (T/R) elements. Generally, the azimuth one-dimensional (1-D) generalized ambiguity function (GAF) and resolution of a MIMO radar system are analyzed by pattern theory, which can only analyze the GAF along the equidistant curve to the radar's center. However, the two-dimensional (2-D) GAF of wideband MIMO radar system shows that its sidelobes are not along the equidistant curve accurately due to the coupling effect between the range-dimension and the azimuth one. Obviously, the traditional pattern theory becomes invalid in this case. To tackle this problem, the 2-D GAF and the spatial spectrum of far-field targets are derived in this paper. By analyzing the 2-D GAF, existence of three individual directions of sidelobes is revealed and it is proved that every sidelobes is along a straight line in the pseudopolar coordinate system. Furthermore, a method to calculate the 1-D GAF and resolution in the arbitrary direction is proposed. Finally, a simulation and two experiments have been carried out to validate the theoretic results. Abstract: In this paper, first, two methods of positioning an indoor receiver with transferred global navigation satellite system signals from cellular base stations are proposed. Then, a technique of fusing the position results produced by the two methods through Kalman filter is introduced; thus, the positioning accuracy is improved. To mitigate the near–far problem generated by signals from base stations and satellites, a pulse shaping scheme and the strategy of assigning pulse patterns to base stations are investigated. Abstract: This paper proposes a new radar detection architecture, which is composed of an interference covariance structure classifier and a bank of adaptive radar detectors. The classifier is based on model order selection theory and the Bayesian information criterion to determine the covariance structure that is deemed to be suitable for a specific set of radar data . This decision stage drives the choice of the radar detector within a specific class of adaptive detectors to establish the possible target presence. The critical issue concerning the constant false alarm rate behavior of the architecture is discussed and two techniques for the threshold setting process are proposed. Finally, the detection performance analysis, conducted on both simulated and measured data, shows that the proposed architecture can guarantee better performance than classic radar decision schemes in scenarios where the interference covariance exhibits structural properties. Abstract: By using the multibeam smart antennas (MBSAs), the nodes can form a high-throughput wireless mesh network with concurrent packet delivery in multiple directions. In this paper, a novel medium access control (MAC) scheme is designed for multibeam airborne mesh networks. It has the following two features: First, IEEE 802.11-compatible, interference-minimized channel access via a special two-layer MAC architecture, where the upper-layer MAC supports the concurrent multibeam transmission/reception, and the lower-layer MAC takes advantage of MBSAs; second, adjustment of the parameters of the two MAC layers to support different mission priorities in airborne networks, including the allocation of time slots in the upper layer. The simulation results demonstrate the superior performance of our proposed multibeam MAC protocols. Abstract: In this paper, we examine an FM-based passive coherent location (PCL) radar system and attempt to quantify its performance in the presence of various different jamming waveforms namely broadband noise and a single tone on the carrier. It is shown that effective jamming can be achieved with relatively low jamming power. The importance of an effective direct signal canceller is also shown as a means of suppressing the jamming signal. The effect of these jamming scenarios is shown through simulation and then compared to a representative measured result from a real FM-based PCL radar system. Abstract: We address the problem of designing a transmit beampattern for multiple-input multiple-output (MIMO) radar considering coexistence with wireless communication systems. The designed beampattern is able to manage the transmit energy in spatial directions as well as in spectral frequency bands of interest by minimizing the deviation of the designed beampattern versus a desired one under a spectral constraint as well as the constant modulus constraint. While unconstrained beampattern design is straightforward, a key open challenge is jointly enforcing the spectral constraint in addition to the constant modulus constraint on the radar waveform. A new approach is proposed in this paper, which involves solving a sequence of constrained quadratic programs such that constant modulus is achieved at convergence. Furthermore, we show that each problem in the sequence has a closed form solution leading to analytical tractability. We evaluate the proposed beampattern with interference control (BIC) algorithm against the state-of-the-art MIMO beampattern design techniques and show that BIC achieves closeness to an idealized beampattern along with desired spectral shaping. Abstract: A binary-hypothesis-test-based algorithm is proposed to assess the confidence of blind analysis results of binary phase-shift keying signals. The reference signal is first constructed based on the given analysis result. The spectrum of multiplication between observed signals and reference signals is used as a distinguishing statistic, and the decision based on the false alarm rate is accordingly taken to verify whether a specific analysis is confident or not. The theoretical analysis and simulation results validate the effectiveness of the proposed algorithm. Abstract: Traditional synthetic aperture radar (SAR) systems tend to discard phase information of formed complex radar imagery prior to automatic target recognition (ATR). This practice was historically driven by available hardware storage, processing capabilities, and data link capacity. Here, we characterize the value of phase in SAR imagery when estimating target features utilized in ATR algorithms for target discrimination. Abstract: A novel star pattern recognition technique for a “Lost-in-space” mode star tracker is presented in this paper. First, the two-dimensional (2-D) vectors connecting the stars are constructed in a rotation-invariant frame. Later, the additive property of 2-D vectors is integrated with the rotation-invariant frame to build a vector sequence for star identification. The proposed technique achieves an identification accuracy of 98.7% and has a run-time of only 12 ms for real-time testing on star images. Abstract: A heterogeneous medium access control (MAC) scheme (with both scheduled and random communications) is proposed for airborne networks. These networks have a hierarchical topology with a small number of powerful aircraft nodes with multibeam antennas and long-distance links at the higher level, and high-density unmanned aerial vehicle (UAV) nodes with single-beam directional antennas at the lower level. Our proposed MAC scheme has the following three parts: First, multibeam, long-distance MAC for aircraft to aircraft links: a dynamic, scheduled MAC is proposed to take advantage of the multibeam features to achieve high-throughput transmissions, and the beam locking/synchronization issues are solved; second, uplink MAC for UAV to aircraft communication: conventional IEEE 802.11n MAC is enhanced with fame aggregation and compressive-sensing-based request polling; and third, MAC for UAV to UAV links: IEEE 802.11e DCF MAC is enhanced through parameter adjustment for channel access. Our simulation results show the significant performance improvement over conventional MAC protocols. Abstract: Three-dimensional (3D) inverse synthetic aperture radar (ISAR) imaging has been proven feasible by combining traditional ISAR imaging and interferometry. Such technique, namely Inteferometric ISAR (InISAR), allows for the main target scattering centers to be mapped into a 3-D spatial domain, therefore forming 3-D images under the form of 3-D point clouds. 3-D InISAR overcomes some main limitations of traditional 2-D ISAR imaging, such as the problem of cross-range scaling and unknown image projection plane. Despite the great advantage of 3-D imaging over traditional 2-D imaging, some issues remain, such as scatterer scintillation, shadowing effects, poor SNR, etc., which limit the effectiveness of 3-D imaging. A solution to these issues can be found in the use of multiple 3-D views, which can be obtained exploiting either multitemporal or multiperspective configurations or a combination of both. This paper proposes this concept and develops the image fusion algorithms that are necessary to produce multiview 3-D ISAR images. The effectiveness of the proposed technique is tested by using real data collected with a multistatic InISAR system. Abstract: A full analysis of position-domain integrity is carried out for the recently introduced generalized integer aperture bootstrapping (GIAB) technique, a data-driven method for resolving and validating global navigation satellite system carrier-phase integer ambiguities suitable for high-integrity safety-critical systems. The analysis can be extended to all integer aperture (IA) techniques that are generalized in the sense of allowing partial integer fixing. It is shown that generalized IA methods produce relative position (baseline) estimates that suffer from nonnegligible biases. Key conditional distributions of the baseline computed from GIAB-validated ambiguities are rigorously derived for both full and partial ambiguity resolution. These distributions enable evaluation of the a posteriori risk from bias in the GIAB baseline estimate. Compared to enforced position-domain integrity risk of cycle resolution, the state-of-the-art high-integrity algorithm, GIAB is shown to satisfy tighter integrity requirements for the same measurement model. Abstract: In this paper, a novel fractional-order fuzzy sliding mode control strategy is developed to realize the deployment of the tethered satellite system (TSS) with input saturation. The considered TSS is modeled as an underactuated system. By decoupling the underactuated system into two subsystems, a fractional-order and a constrained integer-order sliding surfaces are designed for the actuated and unactuated subsystems, respectively. Then, a new hybrid sliding manifold is obtained by coupling the two subsliding surfaces. Adaptive fuzzy algorithm is used to regulate the coupling coefficient in the newly proposed hybrid sliding manifold in order to procure satisfactory performance. Meanwhile, the saturation nonlinearity of control input is also considered. The asymptotic stability of the closed-loop system is demonstrated theoretically. With the existence of fractional order, the presented controller can perform faster and more smooth tether deployment when compared with conventional ones. Finally, the effectiveness and superiority of the proposed control approach are validated by illustrative simulations. Abstract: A new method is developed for integer ambiguity resolution in carrier-phase differential global navigation satellite system positioning. The method is novel in that it is simultaneously data-driven, generalized to include partial ambiguity resolution, and amenable to a full analytical characterization of the prior probabilities of correctly and incorrectly resolved ambiguities. The technique is termed generalized integer aperture bootstrapping (GIAB). A full development of the GIAB is provided herein, including sizing its integer aperture to usually produce a higher prior probability of full ambiguity resolution than comparable existing methods. In Monte-Carlo simulations, the GIAB is shown to provide nearly optimal ambiguity resolution success rates of full ambiguity resolution for relevant integrity requirements under strong models while enabling partial ambiguity resolution. Abstract: An approximate maximum likelihood sequence estimator (MLSE) equalizer for shaped offset QPSK, version TG (SOQPSK-TG) is derived based on the pulse amplitude modulation (PAM) approximation of SOQPSK-TG using the two principal PAM pulses. The resulting equalizer is a generalization of the equalizer based on the Ungerboeck observation model, where the generalization is to two parallel, cross-correlated symbol streams over parallel intersymbol interference channels. The bit error rate (BER) performance and computational complexity of the approximate MLSE equalizer operating over three example channels, motivated by multipath propagation in aeronautical telemetry and with increasing selectivity, are presented. The BER performance was evaluated using computer simulations and shown to be approximately 5–8 dB better than the best frequency-domain minimum mean-squared error (MMSE) equalizers published in the open literature. The computational complexity, measured by the number of real-valued multiplications, is comparable to that of the frequency-domain MMSE equalizers. Abstract: We propose a multimodal and multidiscipline data fusion strategy appropriate for automatic target recognition (ATR) on synthetic aperture radar imagery. Our architecture fuses a proposed clustered version of the AlexNet convolutional neural network with sparse coding theory that is extended to facilitate an adaptive elastic net optimization concept. Evaluation on the MSTAR dataset yields the highest ATR performance reported yet, which is 99.33% and 99.86% for the three- and ten-class problems, respectively. Abstract: This paper presents a guidance law for a booster to meet the requirements of scramjet transition. The straightforward open-loop and closed-loop guidance laws are combined together through a smooth switch. In the closed-loop guidance law, the worst case with a minimal lift-drag ratio is selected to obtain a nominal elevation angle. The excessive energy due to various uncertainties could be dissipated around this nominal trajectory adaptively. Numerical simulations are conducted to validate the effectiveness and robustness of the proposed method. Abstract: This study proposed a novel algorithm for coastline detection in single-polarization synthetic aperture radar (SAR) images based on the local spectral histogram (LSH) and the level set method (LSM). The proposed algorithm includes two main steps. In the processing step, a rough land/sea segmentation is done by utilizing a texture-based segmentation using LSH. In the postprocessing step, the region-based LSM is used to refine the previous segmentation and extract the coastline accurately. The level set (LS) function is initialized using the results of LSH segmentation. This prevents the development of spurious contours, becoming trapped in the local minimum, eliminates the manual support, and also speeds up the LS evolution. A hierarchical LS regularization is proposed using two Gaussian kernels, which is compatible with noisy images and able to detect very narrow regions. The proposed algorithm is able to detect a coastline at the full resolution of the input SAR image and is also robust to noise. A criterion to quantify the accuracy of the results was also proposed. The experimental results for a number of real high-resolution single-polarization SAR images demonstrate that the proposed method is robust to noise and efficient for the coastline detection in different coastal and sea environments. Abstract: In some well-known passive localization methods, when the number of equations equals the number of unknown object coordinates, there arise finite number of possible solutions. A localization disambiguation technique is required to identify the correct solution in these cases. As an example, the exact solution of time-difference-of-arrival (TDOA) based equations for four receiver sites, leads to a couple of solutions with only one of them being the true target position. This ambiguity conventionally is resolved by using angle-of-arrival measurements or using an additional receiver site, which increase the cost and complexity of the system. In this paper, a localization disambiguation technique for a moving target based on sequential measurements is presented. In the proposed method, the correct solution corresponding to each measurement is identified by determining the most sensible path of the target. The method analytically finds the position of the target and no extra measurement/site is required. Performance of the proposed method has been evaluated and verified in numerous simulations as well as real data based on TDOA measurements. Abstract: This paper presents an all-aspect guidance law that allows the missile to achieve the interception of a target at the prescribed impact angle for any initial conditions. The proposed guidance law is designed to intercept a maneuvering target without requiring information of the normal acceleration of the target. In order to develop a guidance law that ensures all-aspect capability, the kinematic conditions that always guarantee the interception of the maneuvering target at the desired impact angle are defined. The defined kinematic conditions are expressed as two error variables for simultaneously satisfying the homing and impact angle control, and the guidance law is derived by stabilizing both error variables near zero based on the backstepping control technique. The analysis of the overall closed-loop dynamics verifies that the proposed law achieves the interception of the maneuvering target at the prescribed impact angle from any initial heading and boresight conditions, despite the absence of the information of the target acceleration. Numerical simulations also demonstrate that the proposed law achieves an acceptable miss distance at the desired impact angle for various initial conditions against different types of nonstationary targets: nonmaneuvering targets, constant-maneuvering targets, and weaving targets. Abstract: Provisioning of Internet of Things/machine-to-machine (M2M) services over satellite has been experiencing a continuous growth in the last few years, which is expected to further increase in the near future so as to meet the demands of users and enterprises. The design of a suitable network architecture is, hence, of paramount importance to properly take into account the requirements imposed by the technology available nowadays and to properly consider the interaction of the so-defined physical layer with transport and application layers. In this light, this paper analyzes the use case of TCP-based M2M services operating over DVB-RCS2 satellite links, where a contention resolution diversity slotted ALOHA access scheme is applied. The main goal of this paper is to provide a thorough understanding of the interactions of TCP and random access schemes, recognized as key elements to enable efficient M2M services over satellite. In this regard, this paper also develops a novel TCP throughput model, which has been validated through extensive simulation campaigns, proving the value of the proposed theoretical framework and its applicability to study the performance of M2M services in more general satellite scenarios. Abstract: The radar echoes of space debris sometimes have drawbacks of inadequate pulse samples, self-occlusion, and data missing, while the state-of-art radar imaging algorithms become unproductive. To tackle this problem, this paper proposes a novel method for three-dimensional (3-D) imaging of space debris. This iterative algorithm terminates automatically and can recover the intensity of space debris radar cross section, making it practical in real-world applications. Unlike the 3-D imaging methods based on multistatic inverse synthetic aperture radar, the proposed method is applicable to monostatic ISAR. Abstract: In the context of radar spaceborne imaging, the novel multichannel staggered synthetic aperture radar (SAR) mode represents a promising solution for the mapping of ultrawide swaths with very high azimuth resolution. This paper extends the analysis of multichannel staggered SAR to planar antenna architectures and provides system design examples both for planar and reflector antenna architectures. Furthermore, a first proof of concept using measured data acquired by an experimental ground-based system is provided to demonstrate the approach's feasibility. Abstract: There are several perturbations that force the satellite orbit to deviate from the elliptical form. To cope with these perturbations, station keeping is applied. For accurate station keeping, determination of the true satellite orbit is necessary. Radio interferometry is one of the techniques used for determining azimuth and elevation look angles of a satellite. In this paper, we introduce three structures based on interferometry for determining the view angles of satellites. The estimated angles are combined with range measurement for orbital positioning of geostationary (GEO) satellites. In the proposed interferometry structures, to acquire the required angular accuracy, the distance between antennas is set larger than the maximum half-wavelength, and the incurred ambiguities are resolved by utilizing properties of GEO satellites. For each of the proposed structures, maximum likelihood estimators are proposed. It is shown that, in low measurement noise cases, these proposed estimators are unbiased and their mean square error achieves the Cramer–Rao bound. Abstract: Maneuverable tethered space net robot (TSNR) is promising for active debris removal due to its flexibility and controllability. However, the contact dynamics of TSNR is not completely understood. Therefore, the contact dynamics is analyzed and the net does not close completely after contact. A super-twisting sliding mode control scheme is designed to make the net completely closed and avoid the risk of tether cut. The efficacy of the controller is validated by simulation results. Abstract: An X-band, Gallium nitride (GaN)-based solid-state power amplifier (SSPA) was demonstrated for more than one year in deep space for the first time. The SSPA consisted of three-stage amplifiers and commercial off-the-shelf (COTS) GaN high-electron-mobility transistors (HEMTs) were used in both the second- and the final-stage amplifiers. During its one year of continuous operation, the GaN SSPA improved equivalent isotopically radiated power with low power consumption such as an average output power of 41.7 dBm (14.8 W), average power consumption of 43.5 W, and average efficiency of 33.7%. In addition, the deterioration rate of output power calculated from the inclination of the linear approximation line was no more than −0.08 dB per year. These results stand comparison with the results of high-temperature, long-term continuous operation test or a total ionizing dose test conducted on the ground. This paper illustrates the space applicability and reliability of the SSPA using a COTS GaN HEMT. Abstract: The problem of optimum sparse array configuration to maximize the beamformer output signal-to-interference plus noise ratio (MaxSINR) in the presence of multiple sources of interest (SOI) has been recently addressed in the literature. In this paper, we consider a shared aperture system where optimum sparse subarrays are allocated to individual SOIs and collectively span the entire full array receiver aperture. Each subarray may have its own antenna type and can comprise a different number of antennas. The optimum joint sparse subarray design for shared aperture based on maximizing the sum of the subarray beamformer SINRs is considered with and without SINR threshold constraints. We utilize Taylor series approximation and sequential convex programming techniques to render the initial nonconvex optimization a convex problem. The simulation results validate the shared aperture design solutions for MaxSINR for both cases where the number of sparse subarray antennas is predefined or left to constitute an optimization variable. Abstract: A guidance and control system is proposed for automatic carrier landing of an unmanned aerial vehicle (UAV). To this end, the position and attitude of the carrier is predicted by considering the sea state so that the UAV guidance loop can be compensated during the final approach phase. The landing kinematics and reference trajectory are determined using the predicted touchdown position. Nonlinear guidance and control laws are designed based on a sliding-mode control scheme to make the UAV robustly follow the reference trajectory. Abstract: This paper addresses the problem of clutter cancellation and slowly moving target detection in digital video broadcast-terrestrial-based passive radar systems mounted on moving platforms. First, we show that conventional processing approaches based on the availability of multiple receiving channels might be ineffective in the considered scenarios due to the impossibility to control the employed waveform of opportunity. Therefore, an appropriate space-time adaptive processing scheme is proposed to cope with the Doppler spread clutter returns aiming at ground moving target indication applications. It exploits the benefits of the reciprocal filtering strategy applied at a range compression stage together with a flexible displaced phase center antenna approach. The effectiveness of the proposed scheme is demonstrated via application to a simulated dataset and then tested against experimental data collected by multichannel passive radar on a maritime moving platform. Abstract: This paper reports a method to analyze surface clutter discrimination for radar sounding interferometry. Nadir-looking low-frequency radar sounders cannot easily resolve off-nadir surface echoes from subsurface nadir echoes. Sounders equipped with multichannel receivers can use interferometric phase to discriminate whether a feature is at nadir or not. We developed a method to evaluate the performance of this application of interferometry and used it to analyze the selected Radar for Europa Assessment and Sounding: Ocean to Near-surface (REASON) instrument on NASA's Europa Clipper mission to Jupiter's moon Europa. Abstract: This paper presents a novel multiple model (MM) method for aircraft conflict detection and resolution (CDR) in intent and weather uncertainty for the next generation air transportation system. It is based on probabilistic MM aircraft trajectory prediction. Conflict detection is performed through the use of predicted probability of conflict (PC). An improved algorithm for estimating PC is proposed and compared with a commonly used method. Conflict resolution (CR) is formulated as a stochastic model predictive control (MPC) problem subject to a constraint on the predicted PC to guarantee safety of the optimized CR trajectories. The cost function to be minimized is tailored to the CR problem and includes the cost of performing evasive maneuvers as well as the average cost incurred by extra travel distance to the destination due to the maneuvers. An efficient algorithm for finding the optimal path (maneuver sequence), with respect to the maneuver cost, is proposed and extended to an overall CDR optimization algorithm for the total cost, in order to produce optimized conflict-free CR trajectories. The proposed search algorithm is essentially a generalization of an optimal list Viterbi algorithm (for unconstrained minimization through a trellis) to the constrained case of our MPC-based CDR problem. The capability and computational efficiency of the proposed MM-CDR method (including PC prediction, optimal search, and overall CDR) are evaluated via comprehensive simulation of a large variety of unmanned aerial vehicle “sense-and-avoid” encounter scenarios, and are compared with existing methods in the literature. Abstract: The stochastic observability of simultaneous receiver and transmitter localization is studied. A mobile vehicle-mounted receiver is assumed to draw pseudorange measurements from multiple unknown radio frequency transmitters and to fuse these measurements through an extended Kalman filter (EKF) to simultaneously localize the receiver and transmitters together with estimating the receiver's and transmitters’ clock errors. The receiver is assumed to have perfect a priori knowledge of its initial states, while the transmitters’ states are unknown. It is shown that the receiver's and transmitters’ clock biases are stochastically unobservable and that their estimation error variances will diverge. A lower bound on the divergence rate of the estimation error variances of the receiver's and transmitters’ clock biases is derived and demonstrated numerically. Simulation and experimental results are presented for an unmanned aerial vehicle navigating without GPS signals, using pseudoranges made on unknown terrestrial transmitters. It is demonstrated that despite the receiver's and transmitters’ clock biases being stochastically unobservable, the EKF produces bounded localization errors. Abstract: A general expression for binary integration for Swerling target fluctuations is developed in terms of the regularized incomplete beta function, which is accurately and efficiently calculated by built-in functions in software packages. From the general expression, optimal thresholds for binary integration are revisited. Abstract: We propose radar image classification via pseudo-Zernike moments based sparse representations. We exploit invariance properties of pseudo-Zernike moments to augment redundancy in the sparsity representative dictionary by introducing auxiliary atoms. We employ complex radar signatures. We prove the validity of our proposed methods on the publicly available moving and stationary target acquisition and recognition dataset. 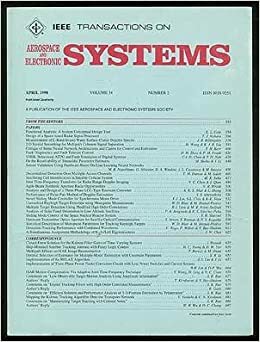 Abstract: Passive radar's ability to observe micro-Doppler phenomena from helicopters, fixed-wing propeller aircraft, and jet engine modulation is examined. Experimental results from a digital television based passive radar demonstrate its potential to observe characteristic signatures of multiple types of air targets and estimate helicopters’ primary rotor parameters. Abstract: Presents a listing of AESS society technical editors along with areas of expertise. Abstract: Provides instructions and guidelines to prospective authors who wish to submit manuscripts.